Amplifier aims to produce this series of installations and performances outside Callicoon Depot using crowdfunding to support artistic and architectural interventions in cooperation with the hamlet’s Art Walk. Agriculture is one of the earliest technologies developed by humans and one of the first exchanged commodities. Increasingly, however, agriculture is industrially produced and land is developed using the same logic of extraction for profit applied to every other economic activity. 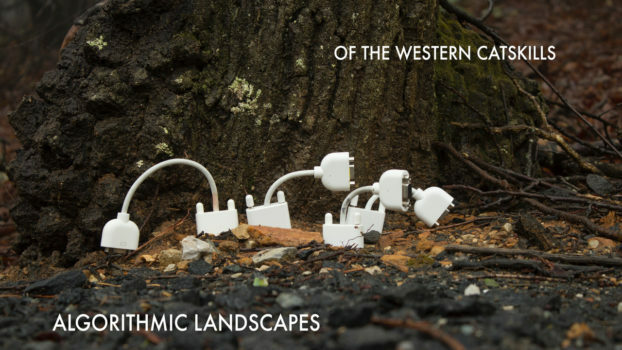 On the occasion of the annual Callicoon ArtWalk, Activating Callicoon: Algorithmic Landscapes of the Western Catskills takes the disused railway station as an opportunity to expose alternative relationships between ecology, landscape, and technology that aim for more redemptive and socially useful ends. Artists from within 100 miles of the Upper Delaware River Valley–including the Catskills, Hudson Valley, and New York City–use earth and circuits, landscape and coding, agriculture and machines, cooking and alternative energy as materials and subjects for installations, events, and performances that promote a conversation about a redemptive future relationship between landscape and technology. Callicoon is a lovely little hamlet in Sullivan County, a swing county in the Catskills mountains in New York state, center of the old Borscht Belt, 12 miles from the field in Bethel, NY where the Woodstock music festival took place 49 years ago. We have invited a small group of artists to create temporary architectural pavilions, geodesic domes, avant-garde performances, clouds of pink smoke, and building-scale video projections, and to shoot gigantic light beams across the Upper Delaware River, as well as to share their fall harvest through regional and international cuisine and contemplate human-made extreme weather events and ecological change through a spectrum of ecological and technological works. Amplifier aims to produce this series of installations and performances outside Callicoon Depot using crowdfunding to support artistic and architectural interventions in cooperation with the hamlet’s Art Walk. To help make this event possible, contribute to its GoFundMe campaign.